First, tell us about the history of Carcass... Who founded it? When? I presume you mean were - originally we were into a lot of American/European bands - Repulsion, Insanity, Siege, Discharge, Macabre, Morbid Angel, Naplam Death, NYC Mayhem, Slayer – but I guess after the first album we stared branching out a bit more - inspiration started to come from other quarters, whilst we retained our own 'identity'. The music has come a long way since 'Reek of Putrefaction'. 1993 revealed to us a new Carcass of sorts. One that no longer focused on the gore-based lyrics that had initially trademarked the band. The dawn of 'Heartwork' cast away the blood-splattered shadows of the past and gave way to a new approach while still retaining the aggression of the previous efforts. Explain to us why the band chose to abandon its former image? I don't think it did. It retained elements of the past and focused on something a bit more cerebral, lyrically anyhow. You could say the sleeve bridged the gap what with the medical conotation's of the sculpture. Lyrically things had been hinted to in parts on the previous album - we couldn't go on recycling the same old themes, which in some ways "Necroticism" was. On the 'Symphonies of Sickness' Cd, the cover bears a vast array of images of the dead. Mixed in with this graphic display of the dead, you've placed cuts of beef and poultry. What are the reasons behind this? To 'flesh' it out, meat's meat right ? 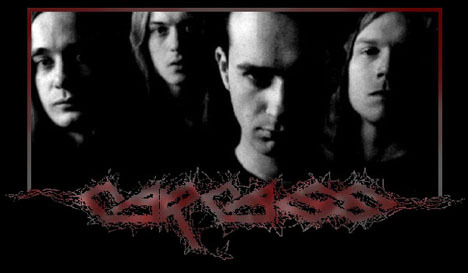 We've heard that the members of Carcass are vegetarians, is this true? Could you explain to us your beliefs on this subject? I don't have any beliefs on this subject. I don't eat meat and haven't for 15 years - I just don't particularly feel the need to eat my cat, so why eat a cow ? The song 'Go to Hell' off of 'Swansong' possesses a bitterness towards the idea of 'hell.' What were your ideas in writing this song aimed at? It's more about the idea of 'sin',You could say "go to hell" is saying that you should enjoy yourself and not have any hang-ups. What are your thoughts on religion? I don't believe in any -it's all superstitious crap, 'Satanism' is even worse as you have to believe in Christianity before you can believe in the existence of 'Satan'. Much of metal has declined back to the underground in recent years. Some attribute this to an over-population of bands cloning others and offering generally nothing new. What do you see for the future of your genre of music? Some of the lyrics of 'Swansong' deal with the corruption of today's world. Both in its peoples hearts and their governments. What is your opinion on the modern world and the situation its in? With the millennial year drawing to a close, some feel that the end is at hand. With problems amounting in every sphere of life, problems never seemed to be solved, but instead covered up and rearranged. What are your thoughts on this? Do you foresee a coming cataclysm? On the cd and inlay card of 'Swansong' is the picture of the pyramid of 'The All-seeing eye'. There is a hand with an instrument tampering with the eye of the pyramid. Could you explain what this symbolizes? It means nothing - the manager designed it - maybe it's just defiling a masonic image used on the dollar...? I'm in a band now with Ken and Carlo who played on that album.The band's called Blackstar and we have an album coming out on Peaceville in August called "barbed wire soul". In some ways it has certain Swansong characateristics - but it's a far better album, a lot more introspective lyrically. Have you or any of the other members ever been involved in other musical side-projects? Mike Amott (who played on Necroticism and Heartwork) has a couple of bands back in Sweded now -Spiritual Beggars and Arch Enemy (very Heartworkish). Have you been doing much touring? The last tour we did was Dec'94. Where have you toured lately and with whom? Our last U.S. tour was with Life Of Agony that year. It was okay. Our best tour was probably with Napalm death and Cathedral and Brutal Truth in '92 -we were on top form. The compilation cd 'Wake up and smell the Carcass'... What was the motivation behind this release? Do you have a contact address available for anyone who wishes to contact you? Alas thanks for your time... Any final thoughts or comments? Nope. Check out the Blackstar album - hopefully we'll find a U.S. label to release it... Peace.